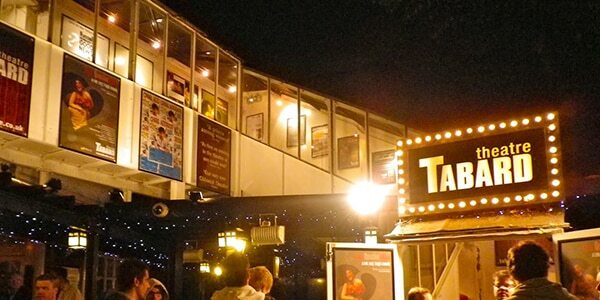 The Tabard Theatre is located above the Tabard Pub. The theatre opened in 1985, founded by a collective of playwrights. Since its opening, it has established a reputation for the presentation of new writing and experimental theatre, as well as hosting stand-up comedy performances (comics who have played the theatre include Dara O’Briain, Al Murray, Russell Howard, and Chris Addison). Pulling Focus Ltd took over the theatre in 2005 and began extensive refurbishment (now completed). From 2007, the theatre began producing in-house to some acclaim (both New Boy and Wolfboy transferred to the west end in 2009 and 2010 respectively). As well as making the theatre space available to hire, the Tabard runs workshops for young people, giving opportunities for emerging artists to perform.